Some of the most exciting news lately for people with New York State ancestry has been the releasing of the New York State vital records indices through the fantastic group Reclaim the Records. For those unfamiliar with New York genealogy, the state of New York has two departments of health, one for New York City and one for the rest of the state (there are some additional caveats to this). New York State began mandating vital record reporting starting in June 1880, although compliance was slow at first. The indices to these vital records (as late as permissible by state law) have been kept at several repositories on microfiche in New York state, but not online. For years, I have relied on the wonderful assistance of the Onondaga County Public Library in Syracuse, the staff of which has done free lookups in their index. Through Freedom of Information requests, Reclaim the Records has obtained these indices, and even more recently Ancestry.com has made this available as a database. This is fantastic for anyone researching their New York ancestors after 1880. My own challenge has been with trying to find the deaths of my great-great-great-grandparents, Steven Henry Shank and his wife Lurancy Perry of Allegany County, New York. Steven last appears in the 1880 U.S. census with his wife in Oramel, Allegany County. Oramel is a village within the town of Caneadea and borders Rushford. Years ago I visited the Rushford town hall and found that Lurancy (as a widow) married secondly in 1892 to a fellow widower named Rial V. Wheeler. I have not found Steven’s death between those years of 1880 and 1892, but do understand early compliance was not always consistent. 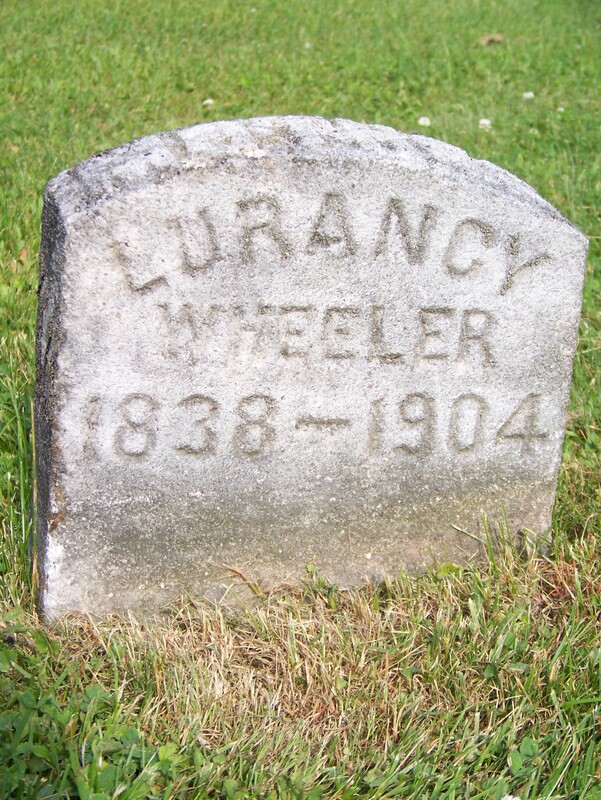 …I looked at everyone named Wheeler and did wildcard searches for the first name Lur*. More recently I discovered my ancestor Lurancy moved with her second husband to Allegany (the town) in Cattaraugus County, New York. I found their gravestones in Allegany Cemetery and her headstone above. Still, I could not find a reference to her death from people looking in the vital records index. I wondered if Lurancy might have died in Pennsylvania or somewhere else. When Reclaim the Records got the full index, I wanted to check the records again myself! And still I could not find her death. Once Ancestry indexed the records, I looked at everyone named Wheeler and did wildcard searches for the first name Lur*. Still nothing. There were a few people named “Laura Wheeler,” but she was not my person. I decided to see if the cemetery might have more information. It turned out the cemetery records were turned over to the town. My e-mail to the town was quickly answered. While the cemetery records did not say anything further than what was on the stone, the clerk added that Lurancy’s death appeared in the vital records of Allegany on 1 June 1904, plus her obituary from the Allegany Citizen mentioned, among others, Lurancy’s daughter: my great-great-grandmother Mary Severance of Burrton, Kansas. 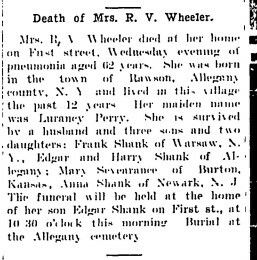 Now I’ll go ahead and get my ancestor’s death certificate, but in the meantime my ancestor Lurancy (Perry) (Shank) Wheeler can go by the pseudonym Queancy Wheeter. *Thanks to Michael Meggison and Stephanie Guthrie for their assistance in this research. Incorrect spellings of names can be frustrating. My grandfather’s birth record eluded me for some time. His name was Keating, but the town clerk spelled it Caton. As I thought about it and remembered my Great Grandparents immigrated from Ireland ad they had an accent. My Grandfather probably pronounced the name Keating as Caton and the town clerk wrote it down the way he heard it spoken. I’m always surprised by how many ways my ancestors’ surnames are (mis-)spelled. One way I’ve been able to find folks in Ancestry census searches is to leave off the last name and only include family members’ given names who I know to have been alive and living together during the time I’m looking for them, and home in on the location. This is especially effective where the father in the family has died and mom has remarried, living with her new husband and the kids usually in the same county. But I’ve also found family groups this way when they’ve moved across the country. Wow, no wonder you couldn’t find her! I loved listening to the episode of Extreme Genes where the woman behind Reclaim the Records was interviewed. She’s a true warrior against the inertia of government foot-dragging! Greetings! Loved your story and I’m very happy you found “Quency”. As far as Oramel, I’ve always thought it to be in Caneadea not Rushford. Maybe there were some boundary changes, but I’ve never known Oramel to be in Rushford. There are also what looks like two old Oramel cemeteries whose remains were re-interred in Belfast in Riverside Cemetery. Hope that helps you find Mr. Shank! Hi Kathi – Quite right. Thanks for the correction. I’ve fixed it above. Caneadea was where my great-grandmother was born, possibly in Oramel which is where her parents were married and her mother Mary was born. Mary’s mother Lurancy was born in Rushford and that was where I found her second marriage when I went to the town hall about 14 years ago. Chris, In my younger days, several decades ago, I learned that a cursive “L” and a cursive “Q” looked rather similar. Maybe that’s why your indexer got “Queancy”. I have also seen cursive “L” and “S” look very alike also. Yes, I have a Lurany (also spelled Luranna) in my tree and it has also been found as Susanna. Luckily, she’s a Mack so I’ve been able to trace her in the line of Joseph Smith Jr’s mom, Lucy Mack Smith. I’ve come across so many erroneous transcriptions of primary sources’ names in genealogical indexes and databases that I’ve lost count. My favorite is still the 1920 U.S. Census entry for my grandparents and uncles. First of all, our last name was written in the census as “Olru” instead of “Olaru,” and then the Ancestry.com transcriber thought “Olru” was “Obra.” But besides the transcription error which made it hard to find my family in that census, the census-taker misheard the names of my uncles Marion and Lawrence, transforming them into girls named Merriam and Florence. But we can blame that on the fact that my grandparents then knew little English and must have spoken in a pretty thick Romanian accent. (My uncle Marion always hated people thinking he had a girl’s name — it’s actually the Romanian equivalent of Mario, not a masculine form of Mary Anne). Great analysis of your search strategy, Chris. I will hope to replicate it with my New Yorkers. The name “Lurancy” reminded me of a woman’s name in my family, “Lodency.” Any ideas how the name originated?